Home Lifestyle Bollywood Ranbir, Alia win big at Filmfare Awards! Mumbai (IANS): Bollywood superstars Ranbir Kapoor and Alia Bhatt won the best actor awards for their roles in the films “Sanju” and “Raazi” respectively at the 64th Filmfare Awards 2019 on Saturday. 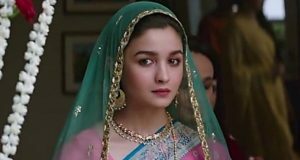 The film “Raazi” won five awards including the category of Best Film, Best Director. The lovebirds grabbed the attention on the award ceremony at the star-studded night that was graced by Bollywood stars like Sonam Kapoor, Jahnvi Kapoor, Katrina Kaif, Sunny Leone, Kajol, Arjun Kapoor, Rajkummar Rao, Sanjay Leela Bhansali, Karan Johar — among many others. While Meghna Gulzar won the Best Director for the film “Raazi”, Gulzar won the Best Lyricist award for the song ‘Ae Watan’. Arijit Singh won the Best singer for lending his voice for the same song. Vicky Kaushal won the Best Actor In A Supporting Role for the film “Sanju”. He also made his debut as a performer at the Filmfare stage and paid a tribute to the legendary actor Amitabh Bachchan his performance was choreographed by Shiamak Davar. The film “Badhaai Ho” on the other hand, also won several awards. Neena Gupta bagged the Critics’ Award for Best Actor (Female). Gajraj Rao and Surekha Sikri won the Best Actor In A Supporting Role awards. Akshat Ghildial won the Best Dialogue Award for the film. Ayushmann Khurana starrer Sriram Raghavan’s directorial venture “Andhadhun” won the Critics’ Award for Best Film. The Best Debutant award has been given to Sara Ali Khan for “Kedarnath” and Ishaan Khattar for “Beyond The Cloud”. Amar Kaushik won the Best Debut Director award for the film “Stree”.